16 images are captured in 2 sec. with our unique zoom funcion and auto alignment function by touching paracenter area. ※Full-auto, semi-auto and manual can be selected in the operation mode. After the measurements, the best image is selected automatically from 16 images. After selecting the best image, analysis is finishe in 1 sec. ※The image can be selected from 16 images manually. Total 17 measurement points including center, 6 in the paracenter and 10 in the periphery can be measurede in the range of 0.25mm by 0.55mm. 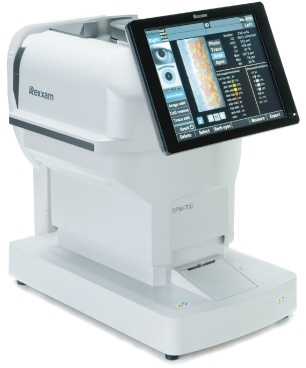 It is possible to capture the endothelial cell and to take a measurement of corneal thickness at the same time. This function enables to edit the contrast, brightness and analysis result of the endothelial cell image caputured. Aoso, it allows to remove cells, add/delete lines and divide/merge cells. 10.4 inch wide color screen. The swivel/tilt function allows the operator to support easily the patient during operation.